We were out of milk and cream (yes I use real cream in my coffee and in cooking, but that is a story for another day), so I went to our local Publix at 6707 Highway 431 S., Owens Cross Rds, AL 35763-9223. This is the grocery store where I usually shop. It is 2 miles from my house, and it is a moderate-sized store with a decent selection of healthy food. They stock good quality produce, meat and dairy items. In the past I never thought about how any of this food was packaged. It is a convenient place to shop and I like the fact that they are an employee-owned company. The employees are friendly and helpful, or at least they were until last night. 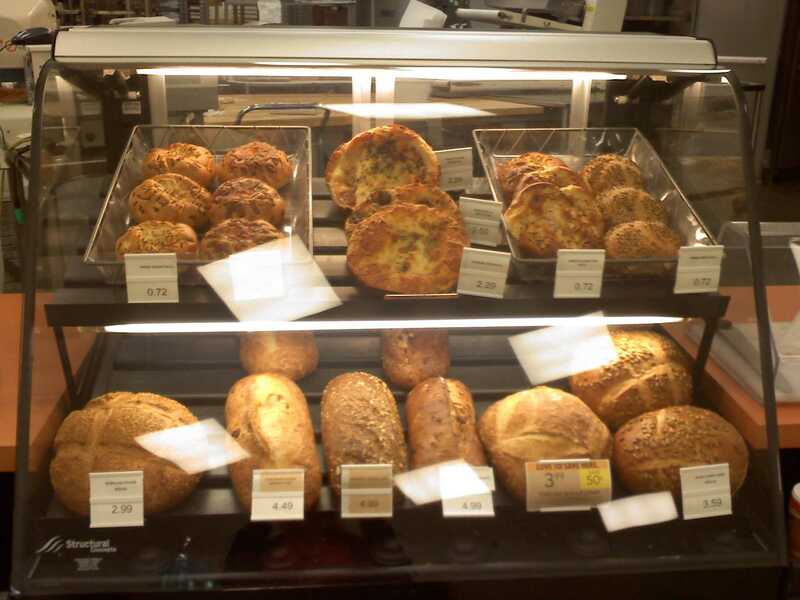 These breads are not wrapped in plastic bags like the rest of the bread at the store is. Once my cloth bags arrive, I’ll try asking if they will place the bread in a cloth bag instead of plastic. Well, if they let me back in the store I will. But I digress. 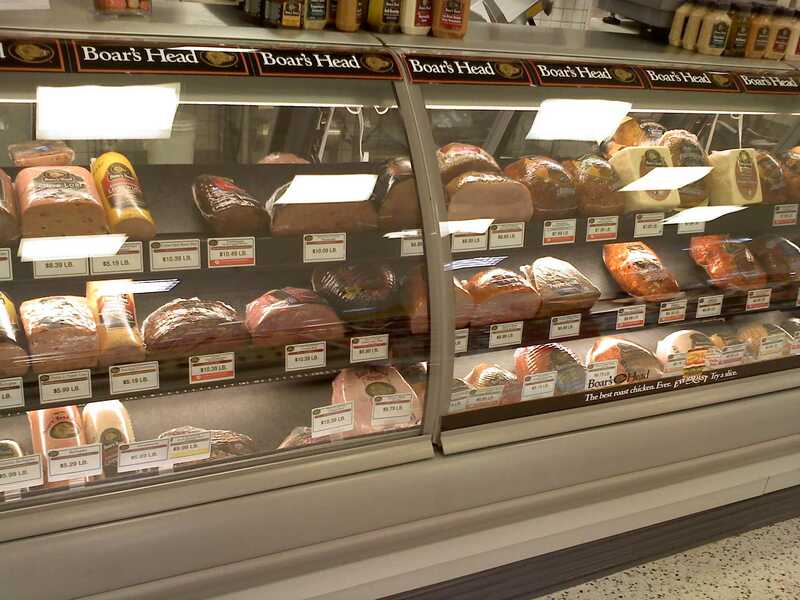 They carry an average selection of deli meats and an uninspired selection of cheeses. If I am going to give up the convenience of sliced cheese I want to at least get something that tastes better! However I think it would be possible to bring my own container and get deli items that are not wrapped in plastic. I will also ask about getting a rotisserie chicken placed in a dish from home. 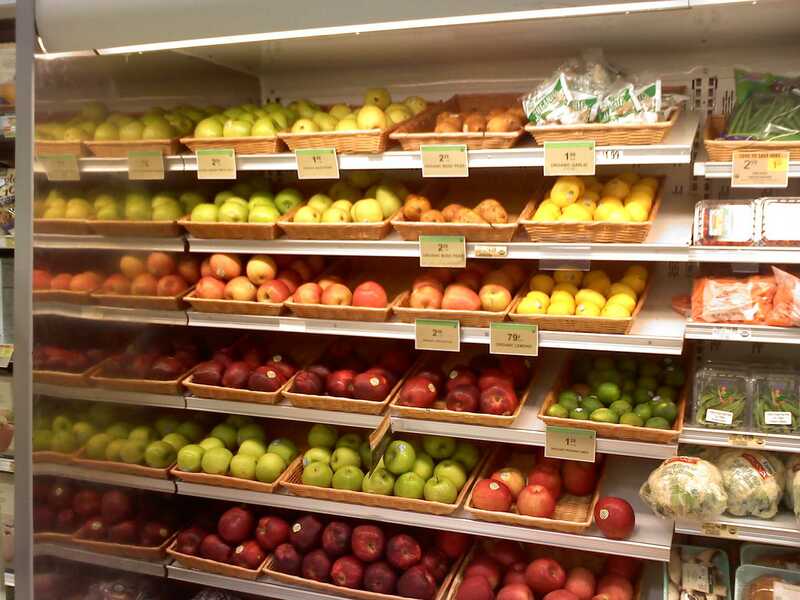 This Publix has a modest stock of organic fruits, vegetables and dairy products (top) and a large stock of conventionally grown fruits and vegetables (bottom). Here I was stopped by the assistant manager and the much more intimidating female cashier whom he had brought with him for back-up. They told me that it had been brought to their attention that I was taking pictures in the store, and that that was against company policy. OK, I get it – they thought I was a corporate spy from Kroger or a secret shopper. But seriously? I wasn’t trying to hide the fact that I was taking pictures. I would think that a spy would do a better job of it. Also, I shop at this Publix at least once a week. I have talked to these employees on many occasions. If they had ASKED why I was taking pictures I would have given them an opportunity to let me know what sort of green initiatives Publix has taken. Oh well, they missed out. And what did I learn from this? Be covert about taking pictures at chain stores, obviously! So back to the shopping. 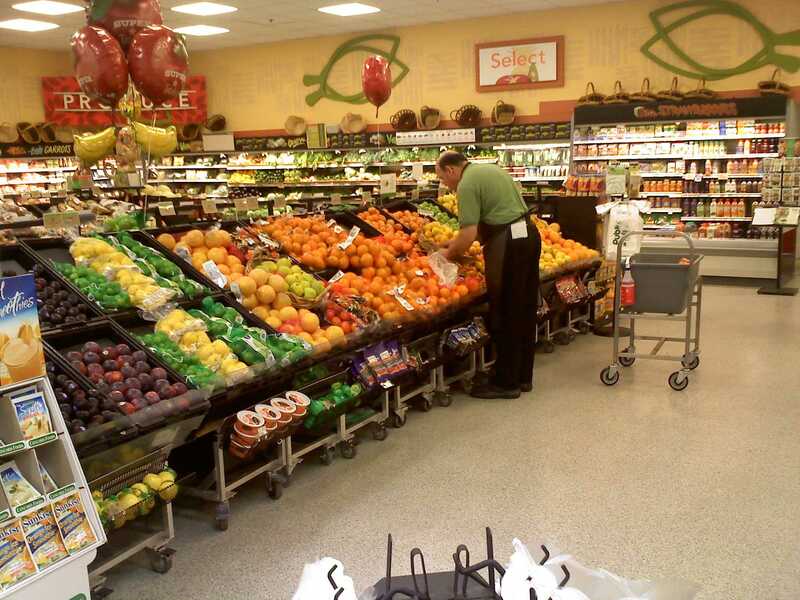 Publix is a standard grocery store with the bakery, produce, dairy and meat around the periphery and packaged goods in the middle aisles. This store does not sell dry goods in bulk. They do have a fish counter where the fish is not pre-packaged, so I will attempt to bring my own container and have the counter person put my fish in that. All of the meats are pre-packaged, but they do a lot of the butchering themselves, so I will ask what my options are next time I need meat. The check-out clerk did not make any comment on my cloth bag and did not try to pre-bag my purchases in plastic bags. They do sell cloth shopping bags at Publix and I have seen quite a few people use them. There are containers out front where you can bring in paper and plastic bags to recycle. I do not plan to give up the convenience of shopping at Publix. However I do think that I will be buying less here in the future. I was very impressed with the Hampton Cove Farmer’s Market on 431. They had a great selection of fresh fruits and vegetables and local honey, and they plan to start carrying free-range eggs, Belle Chevre cheese from Elkmont and baked goods. This is only another couple miles away and I think the food will be fresher. btw, old guys like me remember growing up with a “bread box”. Kind of like a cigar humidor, but for bread. Kept it fresh, but allowed for a nice crust to form. Of course, mold would form if you didn’t eat it fast enough. Totally green nursery and most of the plants they sell produce fruits. Stuff most of us have never seen or heard of. A lot of Russian and Asian stuff. I’ve been to their nursery in Oregon. Thanks for the input, guys! I remember having a bread box growing up – great idea for the future.